im brainstorming a bit about a way how to make a dimer via N-N formation via oxidation. I know hydrazine is made this way but is this method more videly aplicable? 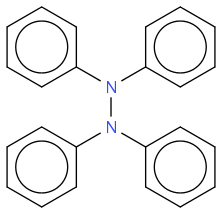 To be more specific, I would like to make a benzimidazole dimer that is joined via the N-N bond. Hypochlorite to chloramines, then Wurtz? Err, I fear I've put nonsense, but I just couldn't resist, sorry! Grignard compound from chloramine + chloramine with catalysis ? And, are there already good news? Anders Hoveland made many syntheses with unsaturated azo rings before entering the university, but he hasn't been active here for a while. Maybe you can find him on the Web, he had a website. Apologies, been a while since I've dropped by so missed this thread when it was active. If you are still working on this, you might check out work by Stahl (DOI: 10.1021/jacs.8b05245) and Baran (DOI: 10.1021/ja5013323) labs in this area. If it will work with benzimidazoles though... who knows. When in doubt, avoid the Stille coupling. Thanks for the papers, both are quite interesting. Im no longer on this though Im on one project now and we will be starting another one soon I think and this was just an random idea. I looked into the literature a bit and found some papers about the N-N linked benzimidazoles and they (and the intermediates) are bit unstable. The Stahl procedure looks like something I could try just for fun to see if it works if I can find the correct Cu source. The 1atm O2 supposedly serves to consume the hydrogen atoms weakly bonded to N and provoke the N-N bonding. Once this hydrogen is bonded to oxygen, I imagine it is irreversibly unavailable. Or could it possibly be instead that the still unbonded carbazole displaces a diphenylamine from the N-N compound, gives it a hydrogen and creates the cross-coupled N-N compound? At least the curve of species concentration versus time supports this scenario.